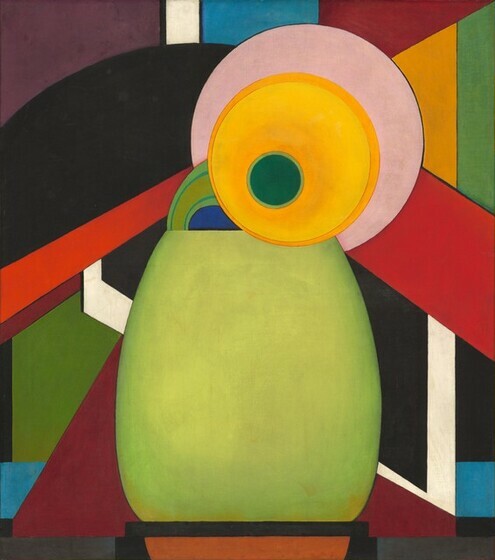 Edward Steichen created Le Tournesol (The Sunflower) in the years after World War I, when he painted, photographed, and gardened at his home in Voulangis, France. Steichen was an enthusiastic gardener, breeding new varieties of delphinium and raising sunflowers and other magnificent blooms. In 1920 he painted this abstract portrait of a golden, black-eyed sunflower bent over a portly vase, a work that combined his passions for painting, photography, and gardening with some of the most contemporary ideas in modern art. In Voulangis, Steichen began a close study of nature. French sculptor Auguste Rodin (whom Steichen had befriended and photographed years before) counseled the painter-photographer to look to the natural world for both inspiration and discipline. Landscapes and flowers became the primary subjects of Steichen's paintings and photographs. He also made an intense study of the mathematical ratios of plant growth, teaching himself plane and solid geometry and reading complicated theory in his quest to discover nature's "golden mean."